In January 2017, SCIPS underwent a rigorous and thorough voluntary inspection, carried out using the BSO inspection framework. Inspectors from Penta International, one of the leading inspection providers who are approved by the British Government and report to the Department for Education (DFE), spent three days in school. The purpose of the inspection was to provide independent and transparent information to parents, teachers, senior managers and the school’s governors on the overall effectiveness of the school and the standard of education it provides. The inspection and report covers the key areas of quality of the curriculum; quality of teaching and learning; the spiritual, moral, social and cultural development of students; their welfare, health and safety; the suitability of the proprietor and staff; the school’s premises; and the school’s complaints procedures. 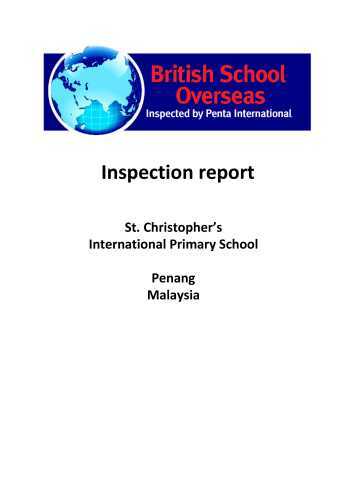 The report identifies what the school does well. Students’ behaviour is exemplary: they have excellent manners, and there are very positive relationships between adults and children. Respect, tolerance and understanding amongst all members of the school community are highly valued: cultural differences are cherished, appreciated and celebrated throughout. After-school activities (ASAs) are excellent in range and quality, and involve all members of staff, as well as some external coaches. Communication with parents is outstanding. Parents are very positive comments about the ease of communication with the school and regularity of information provided. Parents are very supportive of the school and embrace the ethos wholeheartedly. They praise the school highly, appreciating not only the quality of education their children receive, but also what they describe as the genuine care and attention provided by the school ‘family’. Blending the International Primary Curriculum (IPC) with the National Curriculum from England enables good coverage of subjects. With strong priority planning, core subjects are taught as per the National Curriculum. Use of a themed assessment week to gather data has been very effective in enabling teachers to review students’ targets through engaging activities. The information and data gathered is used to set targets with students, and shared in reporting to parents. The plans for the future highlight the school’s commitment to improve the curriculum and facilities, impacting on the quality of learning experiences of the students. A rigorous recruitment process has ensured positive and enthusiastic staff fit in easily to the SCIPS family. Staff talk passionately of their ideas for the future. They feel highly valued as part of the school team and are committed to moving the school forward.